Will you help St Mary’s rise to the Filter Challenge? 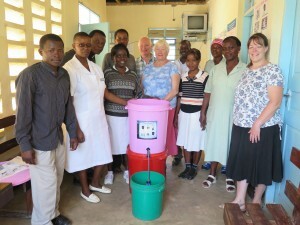 £25 will buy a water filtration kit (including the buckets) to provide clean drinking water in the schools and hospital in Kibakwe. Three were taken out last year and now we would like to send out at least 20 more as they have proved so effective in fighting the spread of water-borne diseases. The Community Link between St Mary’s and Kibakwe started in 2010 and is one of a number of parish links formed within the Diocesan Link between the Diocese of Rochester and the Diocese of Mpwapwa. For more information on the Diocesan Link click here. Read more about St Mary’s 2016 trip to Kibakwe by clicking here and to read more about the St Mary’s 2015 Kibakwe Trip by clicking on the December 2015 Quarterly News and the March 2016 Quarterly News.